On Tuesday, March 2, SOS braved the weather and traveled to Honea Path Elementary to help celebrate Read Across America. 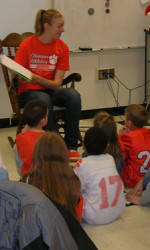 Alexa Rand (volleyball) read to various kindergarten and first grade classes and discussed the T.I.G.E.R.! traits with them. Each student received a copy of the latest Be a T.I.G.E.R.! newspaper. SOS attended a Dance Marathon held on Friday, March 5 at Fike Recreation Center. Catalin Baciu (men’s basketball), Laura Browning (swimming and diving), Caroline Fregeau (rowing), Victoria Graham (rowing), Michelle Nance (rowing) and Garrison Stevens (swimming and diving) visited with children and their families and signed autographs to raise money for the Children’s Miracle Network.